Tom M's was always the 'leader' (whatever that means), and coined the name 'Skyfishers'. 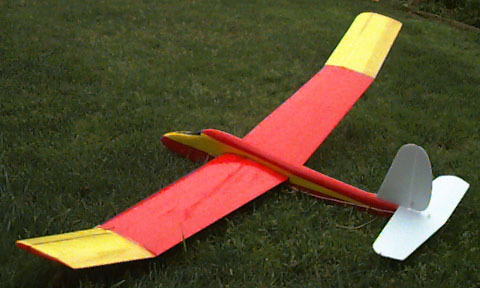 Tom M. says, "I really love this form of RC flying using Handlaunch Gliders (HLG). Flying the HLG is a lot like fishing, you need the same kind of patience to repeatedly throw out your plane like a fish line, then carefully watch it, 'feeling out the air,' waiting for just the right bump - like a fish bite - to reveal the presence of a warmer air pockets which you then want to 'hook into' - like setting the hook - by making tight circles so it can carry you higher and higher. Sometimes, actually most of the time, I lose a pocket of warm air too soon and have to search for another - just like fishing. But on occasion you can 'hook into the big one' and ride it high until you 'speck' out. When you are done you don't even have to clean it. To me there is real romance to this activity especially on those beautiful days or evenings when the lighting is just right and it is you and your very personal interaction with the air and your plane." Tom also has some other 'borrowed' analogies, "A breeze runs through it..." and "Dances with Birds...". If you're interested in flying with us skyfisher geeks or want to know places around Northern California to go fly, send me mail and I'll let you know who's who in the group and where we'll be. The location is Rancho San Antonio Park in Los Altos, California. I don't fly there too much anymore as work has got me bogged down to the point of taking 100% of my time during the week, not to mention those trips to China, Japan, and India. But I have seen on occasion, a couple of stragglers tossing their handlaunch planes for an hour or so in lieu of lunch. Sometimes there are a few handlaunch purists that visit Rancho on Saturdays and Sundays, usually after 12 as there's a large collection of electric aircraft pilots before that time.